The I Am UU project is coming up on its 5th anniversary.So much has changed in that time, both for me personally and for the project. 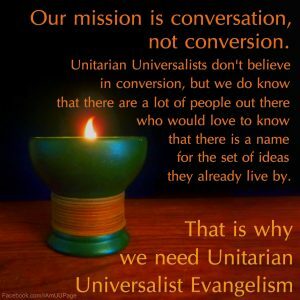 As it has grown, I have seen myself move from being just a blogger and passionate UU evangelist to more of a religious educator and community leader. I have seen the project move from an attempt to network and collect ideas to a place where others turn for ideas and information. In short, it has helped me define my calling and my long-standing desire to build tangible good in the world. At the beginning of this year, I set out some goals and some hopes for 2015. One of those was to fund my personal growth as a religious educator through crowd-funding, which has not gone as well as I need it to, but better than I was told it ever would. Another goal was to publish a blog post here each week, which I admit I have not yet lived up to, but I am not giving up. The one I really want to address today, though is the extremely optimistic goal that we would have 5,000 Facebook fans by May. In 2013, with about 500 fans, I started doing some very basic graphic design. That caused the community to grow a little faster, and at the end of September the page had almost 1,000 likes. And by the end of the first week of November, the community had more than doubled in number. That wasn’t coincidental. The people sharing those posts, along with some of our text posts and links, led to a lot of exposure and caused amazing growth. They allowed people to see some of what was going on, and those people wanted to be part of what we were trying to do. Be engaged. Make comments. Share posts. Invite friends. That is how we’ve gotten to 4,400 community members, up to about 100 people per month so far this year. It could easily get us to 4,500 this month. That is the kind of promotion we want and need. We also still need your feedback. We need your input. We need your links and your quotes from Sunday morning. We need you all to be a community, and we have seen it happening. Don’t be afraid to make a suggestion or offer some words of support to one another, either. From my end, I will keep working on my resolutions, as they have not all become habit yet. I continue to learn new tricks in graphic design, and I have been lucky enough to see my library expand, in part thanks to the generosity of friends and the I Am UU community. I want to attend training sessions as I am able. As the I Am UU project now seems to be, at its core, about religious education, I would really like to take the UUA’s Renaissance Modules, starting with “Philosophy of Religious Education”, “UU Identity”, and “Multicultural Religious Education”, as those are things that seem to fit well with the goals and the obstacles experienced in the last year or two. Again, this all comes out of my own pocket, and so I will not be rushing through them, but I am going to do what preparation I can from the materials available on-line. My hope is that this work will grow to be a better resource and an instrument of growth for UUs across North America. My intent is to keep learning and expanding my skill set, and maybe even receive a few submissions from you all. My goal is to become the religious educator that this project needs me to be in order to live up to the need it has grown to meet. All of that depends, partly, on your participation to build our following into a community. Being your admin has been the most rewarding challenge I have taken on outside of raising children. I cannot overstate how much it means to me. 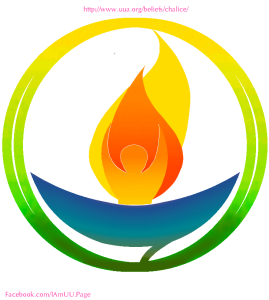 I want to do better at it, and I want to keep supporting congregations, volunteers, and religious educators with my work, as well as being a place where people can learn more about liberal religion, what it means to be a Unitarian Universalist, and how we can better invite others to be part of our communities. I rely on you all to make that possible. I have only been able to grow to fill this need because people have sent me resources, links, words of thanks and encouragement, and financial patronage. I know I am truly blessed by this community, and I hope to continue to be more and more worthy of your trust and support.